International Journal of Research in Health Sciences,2013,1,3,103-109. 1,4Assistant Professor, 2,3Professor, Department of Community Medicine, Dayanand Medical College & Hospital, Ludhiana (Punjab), INDIA. Background: Menopause is a physiological process, which takes place universally in all women who reach midlife During the transition to menopause, women may experience vasomotor, urogenital, psychosomatic and psychological symptoms, as well as sexual dysfunction The prevalence of menopausal symptoms varies widely not only among individuals of the same population but also between different populations. Objective: To determine the prevalence of menopausal problems among the middle aged women. Material and Methods: A total of 180 women aged 40-60 years were selected by proportionate sampling technique. Menopausal problems were categorized into 5 groups i.e. Vasomotor, Psychogenic, Urogenital, Skin, other health problems. The frequency of the individual symptom was observed in each subject. Result: In the present study, 25.0% subjects were Premenopausal, 9.4% were Peri-menopausal and 65.6% were Postmenopausal. 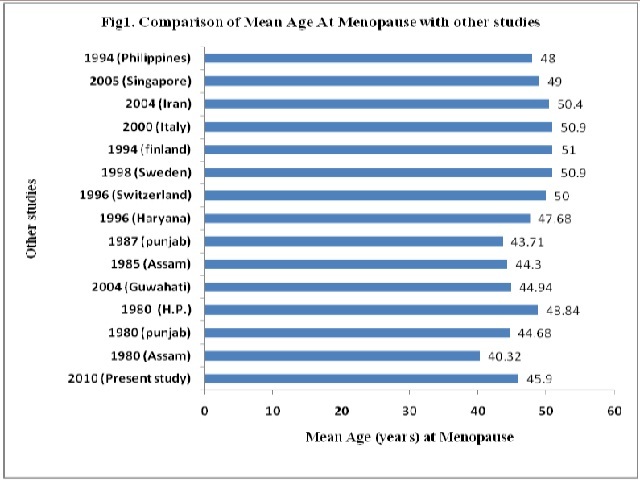 Mean age at menopause was found to be 45.91 (± 3.47) years and median age was 46 years. Symptoms, which were reported more frequently in the present study were headache (94.1%), dizzy spells (81.5%), decreased libido (81.5%), sleep disturbance (68.9%) and loss of interest in most things. Other symptoms, which were found common among the subjects, were hot flushes (59.3%), lack of concentration (54.1%), mood changes (49.6%) and night sweats (35.6%). A very few subjects reported symptom like hair loss, increase in facial hair, urinary tract infection, urinary incontinence, prolapsed uterus, and dyspareunia. Conclusion: Mean age at menopause was found to be 45.91 (± 3.47) years and median age was 46 years. Headache (94.1%) and dizziness (81.5%) was the most commonly reported vasomotor complaint. Most frequent psychogenic problem reported was sleep disturbance (68.9%). Regarding the urogenital problems, it was decreased libido (81.5%) which was most frequently reported.